The book reads like a novel and tells the story of Canada’s engagement in the American Civil War through the lens of six fascinating characters: a fugitive slave, a covetous American secretary of state, a New Brunswick woman who served in the Union army disguised as a man, a newspaper man turned political visionary, a master of Confederate spies operating from a Toronto hotel, and the masterful politician who forged a nation under the imminent threat of invasion. The gripping account offers a fresh understanding of the founding of one nation, and the redemption and revival of another in era that continues to define them both. Blood and Daring became a national best seller when released in hardcover and e-book in May, 2013. It was released in paperback in May, 2014. 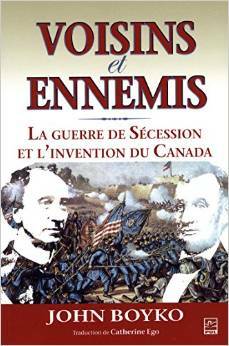 In November 2014, Laval University Press released it in French translation and was shortlisted for a Governor General’s Prize. “In this lively and eye-popping book, John Boyko shows how the war and its aftermath not only gave the United States a new birth of freedom; it also gave birth to the new nation of Canada.” – James McPherson, Princeton University’s Pulitzer Prize-winning author of Battle Cry of Freedom. I just finished reading blood and daring. I had to laugh at my complete ignorance of any Canadian role in the US civil war. I don’t recall a single mention of any of those issues in my California education. Very refreshing to view my home country through a different set of lenses. Thank you very much.